Elevated sinks in the pedicure area mean easy soaking for clients and less back strain for the technicians. 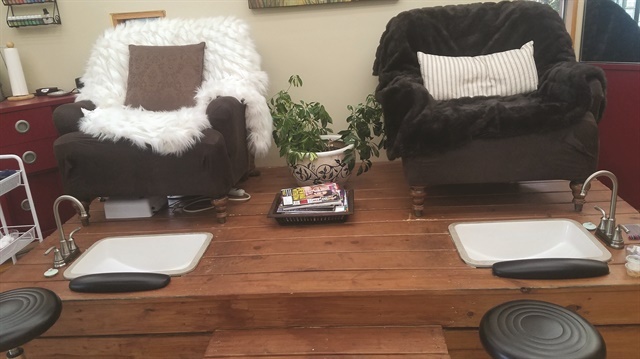 “I spent two years sitting at a manicure table and had so many lower back issues from hunching over while I was working, I left work in immense pain every day,” says Hannah Sass, co-owner of Head to Toe Spa and Nail Bar (headtotoespaandnailbar.com) in Saint Joseph, Mich. 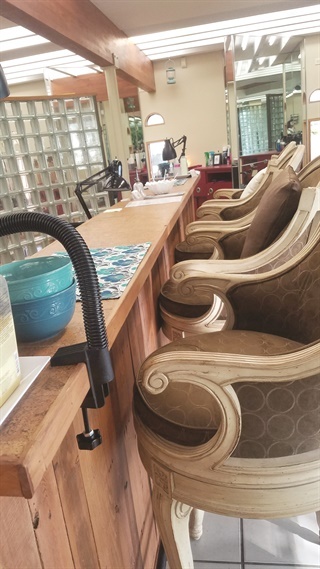 So when the time came to design the manicure and pedicure spaces for her salon, nail tech comfort was just as much a priority as pleasing clients. The nail bar was built with recycled wood from pallets. The top is cork flooring, which is stain- and acetone-resistant. Beyond the ergonomic benefit, the setup — which allows clients to sit or stand as well — permits more freedom of movement. “Most of us at the salon are high energy people, especially myself,” says Sass. “During long appointments, I noticed the techs and our clients getting antsy and readjusting their position frequently. The ability to stand helps with that.” It’s also a plus that clients can sit side by side and chat during their appointment. The salon can accommodate older or larger clients who find it tough to get into the higher chairs in other areas of the salon.